Chris and I were recently invited to the wedding of a lovely couple. While I wasn’t able to make a full quilt, I did want to give them a little something homemade. 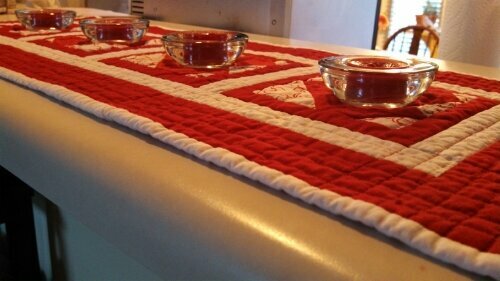 The result is this table runner. Their kitchen is red (I think!) and I happened to be working on it in February/March. That meant lots of patterns for hearts floating around, and I figured that was appropriate for a wedding. I used this pattern for the hearts, but didn’t sew them together. I then just made the borders as I went. The back is just stripped, which I think allows it to be reversible for a change. 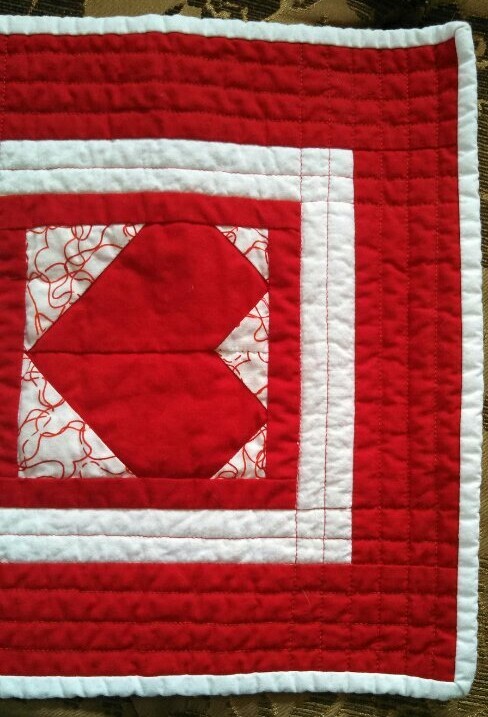 The quilting is straight lines in each direction making it dense in the corners. I left the blocks themselves alone to make them stand out a bit more (and because it was hard to quilt them without it looking sloppy!). I finished it off with some candles and delivered it with some other little things from their registry. Overall it was a fun and quick finish. I hadn’t pieced squares on a while, and it’s fun to see them come together. I figure even if they don’t use it all the time, it’ll work for Valentine’s Day and Christmas instead!